« Pictured below is CJ, my dependable observing partner of many years. She is always ready to go outside and keep me company. Open cluster, NGC 2362 is a beautiful and interesting cluster, which can be easily observed with the smallest of telescopes, even with a moderately light polluted sky. However, like all deep-sky objects, a reasonably dark sky is needed to fully appreciate. The bright 4th magnitude star Tau, creates a glare that subdues many of the dimmer members of the cluster. I could count approximately 20 stars with a greater concentration of faint unresolved stars just west of Tau, creating a light glow. 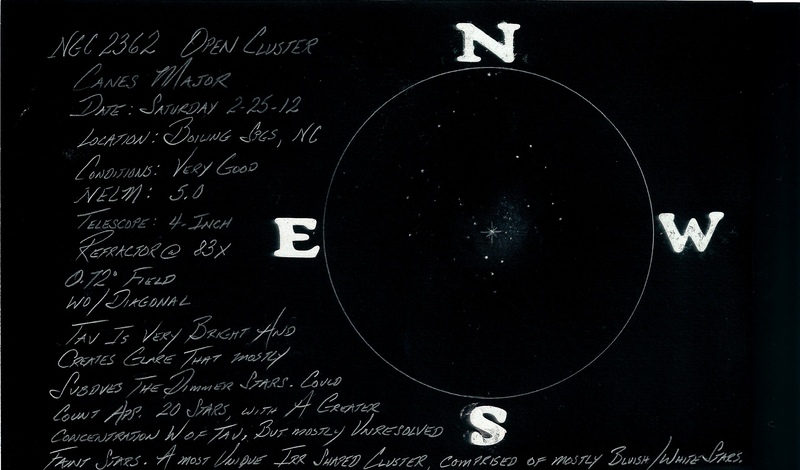 The cluster has a mostly irregular shape and is comprised primarily of bluish/white stars. The above pencil sketch was made using a 102 mm refractor at 83x, from my moderately light polluted backyard in western North Carolina. This entry was posted on April 18, 2012 at 11:02 pm and is filed under Work File Only - Observer's Challenge Reports. You can subscribe via RSS 2.0 feed to this post's comments. Both comments and pings are currently closed.